The possibility that Portland Public School teachers might strike for the first time in city history triggered a massive demonstration by the Portland Students Union at Monday night’s Portland Public Schools meeting. The twist is that the demonstration drew national attention and name-calling from a prominent conservative blogger, as well as a political “citizen journalist” who videotaped the students’ activities and posted them online as a form of ridicule. The video appeared on the “Laughing at Liberals” Youtube channel and Sandini’s “Daylight Disinfectant” website. A quick look at Sandini’s website shows his apparent dislike of “multiculturalism” and liberalism in general. In one of the two protest videos he recorded Monday night, a JeffersonHigh School student leader is called out by name. “After crashing the Portland school board meeting, Sekai Edwards leads a profanity laced chant in front of small children and shouts other nonsensical crap into the megaphone,” it says. Sandini earned ridicule of his own in 2010 when he was thrown out of an Urban League candidate forum for disrupting the event in at the EmanuelTempleChurch in North Portland. As reported by Denis Theriault of The Portland Mercury, Sandini had at first been known anonymously as “Daylight Disinfectant,” videotaping the Occupy camp and posting his film with an array of insults. However, The Mercury tracked Sandini to the EmanuelTempleChurch incident, which the right-wing blogger developed into a critique of “free speech” which he implied was violated by Portland’s black community at the candidate forum. His video of the incident, posted on his website and on The Portland Mercury, features two of Portland’s prominent Black leaders asking him to turn off his camera, interspersed with Sandini’s apparently ineffective attempts to identify their names; soon a third well-known community figure directly punches the camera lens. 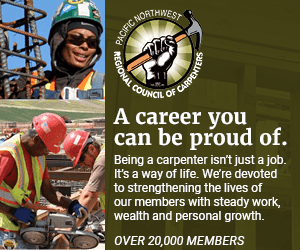 Sandini and Malkin’s name-calling spree comes as Portland’s district and teaching union enter their tenth month of negotiations, with a mediation session scheduled Thursday. Rob Cowie, spokesperson for the Portland Public Schools, said Tuesday that the two sides are working for a settlement. The Portland Association of Teachers did not respond to a request for comment by press time, but they and the district remain in mediation. The Portland Students’ Union first came together when over a thousand students marched to Pioneer Courthouse Square on May Day of 2012 to fight against budget cuts by the state legislature. Now the students are rallying behind the teachers, with boisterous rallies and at least two school walkouts so far. Students at JeffersonHigh School walked out Jan. 10 to voice their support for their teachers and to demand smaller classes. Chanting, “We are the future,” and, “We deserve a better education,” the students marched out of the school and walked along North Killingsworth Street. Some held signs with messages such as “We love our teachers,” and “No racist school closures." Students at WilsonHigh School walked out Friday, and a small group of Cleveland students came to support the Jefferson protest. Among the students demands’: smaller class sizes, wrap-around support services, less standardized testing and a no school closures, and advanced classes in every school. Find out more about the Students’ Union at www.portlandstudentunion.org. Follow the teachers’ union activities at www.pdxteachers.org. Follow the Portland Public Schools bargaining bulletins by clicking here.